ATLANTA, Georgia (CNN) -- Julius Derico Jr. didn't need to travel to the Vietnam Memorial Wall in Washington to pay tribute to his fallen comrade -- the first casualty of his unit in Vietnam. 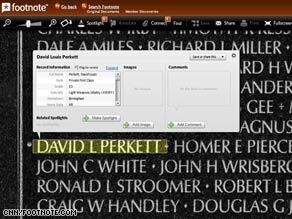 Users can search the digitized Vietnam War Memorial Wall for details about soldiers who died. As he huddled around a computer with other veterans, he searched for his friend's name in a newly digitized version of the Wall. While it's just one of the Wall's 58,320 names, Derico said he hopes people understand that it represents something more than just an inscription. The virtual Wall, a project created by the National Archives and Footnote.com, brings the memorial to millions of American homes. To create the digital image, photographers used more than 6,000 photographs of the Wall, which measures about 460 feet wide. "We can use that to help console people ... To help people realize that ... they are gone but they are not forgotten," Derico said. "We can show it to you [online]. Your brother, your sister ... They're still there; they are being thought of and they are being treated with due respect." Derico will never forget. The thought of that first death in his unit still chokes him up. David Perkett was killed one night when a fellow soldier accidentally discharged his weapon. At the age of 20, Derico had to identify the body. It was not prepped. It was not cleaned. His comrade was covered in dried blood. "It was devastating," Derico said, visibly shaken. As some people searched the virtual Wall for people they knew, others shouted names from across the room, hoping someone would enter a search in the computer. Some only knew the first names and hoped to match them with the database by unit or hometown. As they found more names, the group grew in size, huddling closer together as they read the casualty report of the latest name. For Robert Love, who served in Vietnam as a mechanic, being able to view the Wall with fellow comrades gives the memorial new meaning. As he used the online version, he reflected on a trip to Washington, where he visited the Wall. "I had so many different emotions; and then after a while, as you begin to look at the names on the wall, it overwhelms you," he said. "Then you realize that you could be up there, but by the grace of God you aren't." As they located familiar names and learned more about them, the group's excitement grew. Everyone agreed that other veterans should know about the site, and they agreed to spread the word. Some suggested including the site Stand Down -- an event that helps homeless and indigent veterans by providing them with food, clothing and other necesseties. So many veterans end up with no home, no benefits, no money and drug problems, Love said. Many are simply stuck in a cycle, unable to let go of the horror of war. "War is hell. There's no other way to put it. And when an individual goes into a situation where he or she takes the life of another individual, it's devastating and you never really get over it," he said. "At times, when you go to sleep at night, you see just like you were there. You wake up in a cold sweat -- scared; and after so long it starts wearing on your body."